“Does old Scotty still make a living from finger wagging?” A question asked by an Irish man who had known Scott Kelso since both were children. The answer: “Yes, and doing quite well, actually” triggered the much tougher question: “What can be studied there for half a life span?” Such was not possible to respond in detail as we were at the airport in Miami and had to catch our flights. 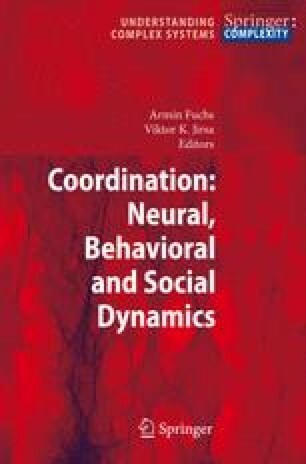 But the question remains, in more scientific terms: Why do we study coordination dynamics? Why are not only psychologists and kinesiologists but also theoretical physicists interested in finger wagging? Theorists appreciate laws and first principles, the more fundamental, the better. Coordination dynamics provides such laws. They are the basic laws for a quantitative description of phenomena that are observed when humans interact in a certain way with themselves, with other humans and with their environment.